The U.S. government is preparing a safety warning about baby slings  those popular and fashionable infant carriers that parents can sling around their chests to carry their baby. The concern: Infants can suffocate, and at least a few have. The head of the Consumer Product Safety Commission, Inez Tenenbaum, said Tuesday that her agency is getting ready to issue a general warning to the public, likely to go out this week, about the slings. "We know of too many deaths in these slings and we now know the hazard scenarios for very small babies," said Tenenbaum. "So, the time has come to alert parents and caregivers." Tenenbaum spoke at a meeting of the Juvenile Products Manufacturers Association, an industry trade group that certifies certain children's products, including soft infant carriers. Tenenbaum did not single out any specific baby slings or discuss the number of deaths linked to them. But there have been complaints for a couple years now about some baby carriers. In 2008, Consumer Reports raised concerns about the soft fabric slings and some two dozen serious injuries, mostly when a child fell out of them. A follow-up blog warned about a suffocation risk and linked the slings to at least seven infant deaths. Consumer Reports, published by Consumers Union, complained about the "SlingRider" by Infantino. The "bag style" sling wraps around the parent's neck and cradles the child in a curved or "C-like" position, nestling the baby below mom's chest or near her belly. It's the "C-like" position that causes safety advocates to shudder. They say the curved position can cause the baby, which has little head and neck control in the early months, to flop its head forward, chin-to-chest  restricting the baby's ability to breathe. Another concern: that the baby can turn its face toward mom's chest or belly and smother in the parent's clothing. Infantino's "SlingRider" was recalled in 2007 for problems with the plastic sliders on the sling's strap. But there have been no recalls because of a suffocation risk. A message seeking comment was left with an Infantino representative. Baby slings have been billed as an important way for new moms to bond with their babies. Use of slings, also known as "babywearing," has become increasingly popular in recent years, with colorful and vibrant slings seen on Hollywood moms and sold everywhere from big retailers such as Babies R Us to smaller outfits like BabySoSmart.com in Kansas City, Mo. Tiffany Speck, a nurse who owns BabySoSmart and sells her own baby carriers, has been warning about slings where the baby falls into a chin-to-chest position in the classes she teaches at hospitals, stores and doctors' offices. "You wouldn't want to put a baby in there," Speck said during an interview with The Associated Press. "The baby is curling, head toward toe, and what happens is the baby occludes its own airway." 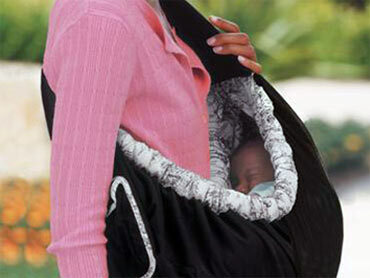 Speck recommends that babies in slings remain in an upright position, with the baby's tummy facing mommy's tummy.